See scan - very good condition. 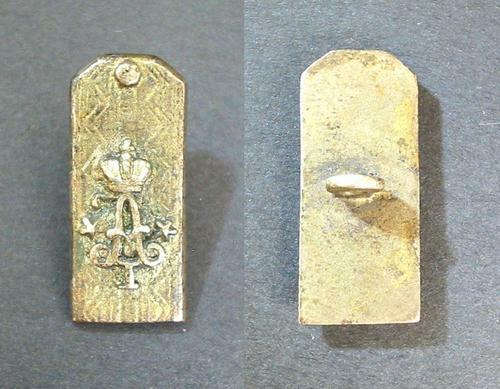 This is a nice and scarce 1880 early Bulgarian Royal Army officer jeton badge with monogram cypher of Prince Alexander I Batenberg. The badge is in the form of an officer uniform and tunic's shoulder board and is made of silver plated bronze or other metal. This type of jeton resembles the Imperial Russian Alexander types of jetons and badges as worn by the officers of the Imperial Russian Army. After the Russian Turkish War the newly established Bulgarian Army was under heavy Russian influence and many early decorations were of a Russian design or make. The shoulder board jeton badge measures 22mm x 10mm and is Lifetime Guaranteed Authentic!!! First time we have this type for sale. Scarce military / militaria collector piece and one of the rare Bulgarian badges and decorations.